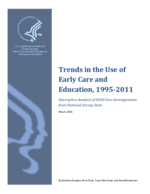 In this report, we examine trends in the use of early care and education (ECE) from 1995 to 2011 by utilizing two large, nationally representative datasets: the October Supplement of the Current Population Survey (CPS) and the National Household Education Survey (NHES) of Early Childhood Program Participation. Together, these sources provide a broad set of descriptive data that show trends over time. There are important differences in survey wording and timing, highlighted in the below table, that pertain to our analysis and findings and also contribute to our following definition of terms (pg. 9).